We have recently finalised the development of a Council Satisfaction Model. This model was developed by running specialised analysis from over 30,000 LGA interviews conducted since 2006 and identifies the derived importance of different aspects of council activities and the impact they have on overall satisfaction with the council. Micromex Research presented this to the LGMA in February 2011. This analysis provides a clear understanding of how councils can up-weight community satisfaction by identifying the priorities and initiatives that will positively drive overall satisfaction with the council. From comparing the results of the Shapley Value Regression with a standard importance scale question, we identified that derived drivers of community satisfaction with council did not correlate with the attributes that the community stated were important. In the example below, even though ‘Access to Council information and Council support’ has a lower relative stated importance – it is a key driver of resident satisfaction. The learning from this is that if you solely rely on the stated community priorities, you may not be allocating the appropriate resources to the actual service attributes that will improve overall community satisfaction with council. This is primarily because with ‘stated importance’ questions, people do not differentiate very much between the importance of different items (e.g. everything is important – see previous chart), therefore, outputs based on stated importance questioning lack sensitivity in identifying actual hierarchies/priorities between service attributes. If a council wants to better allocate resources and priorities, it needs to understand the dynamic of community satisfaction with council. By identifying and then focusing on the derived drivers of overall satisfaction, council is able to proactively improve community satisfaction with council performance. 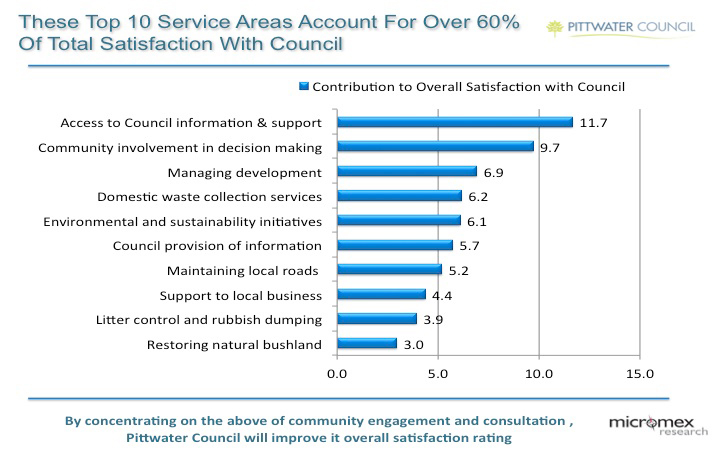 Of the 35 services/facilities we evaluated for Pittwater Council, we identified that the first 10 of these are the majority drivers of resident satisfaction. We can see in the graph below that ‘maintaining local roads’, which so very often is one of the key areas of community focus in many community surveys that rely on stated importance and satisfaction analysis, is actually only a secondary driver of community satisfaction with Pittwater Council, whereas community engagement variables such as ‘Access to Council information and Council support’, ‘Community involvement in decision making’ and ‘Council provision of information to the community’ account for over 25% of the overall satisfaction with Pittwater Council. This outcome is not unique and from our analysis across a dozen LGAs in the last 12 months, we can clearly see that one of the key drivers of overall satisfaction with council is driven by the content and scope of council interaction with residents. We have found that the qualitative phase allows us to fully explore the community responses from the quantitative phase and achieve a deeper understanding of the community’s perspective and their reaction to the community priority areas. The regression analysis also allows us to map stated satisfaction with the derived importance, to identify opportunities to improve resident satisfaction at either a specific or general level. A Shapley Value Regression will provide Council with a complete picture of the unique priorities of its residents and to identify which attributes are the key drivers of council satisfaction. These outcomes will provide Council with a robust level of understanding of how to address community priorities and leverage community satisfaction with Council.